Unless you are very lucky, at some point in your dog?s life he will get a wound. This could be a very small wound or a large gaping wound from being hit by a car. In all cases, some basic care by you can help speed the healing process along. If a wound is fresh and blood is spurting out, an artery has probably been nicked. Do NOT use a tourniquet unless you are trained in the use of one! Just applying steady pressure with your hand will stop most bleeding. If you have clean gauze you can gently wrap a bandage around the wound while you contact your veterinarian. Luckily most wounds we deal with are smaller and less complicated. If your dog does show up with wounds, unless there is severe bleeding, look over the whole dog first. She might be having serious problems breathing which are more serious than the wound despite it horrifying you with the dripping blood. If the wound(s) seems to be the primary problem you can proceed with wound care. In order to heal, wounds need to be cleaned up. While we hear so many stories about the healing power of dog tongues, reality is that tongues can do harm as well as good. You want to help clean out the wound and as soon as possible. A wound open for 4 hours or more will start to grow bacterial colonies. If your dog has long hair, clear it away from the wound area. This may mean even having to clip hair. Try to put a water soluble gel around the wound itself to prevent short hairs from getting into the area. Carefully remove any large obvious debris like small stones, leaves, etc. Please note that this may be uncomfortable and even the sweetest dog may snap. A muzzle can be invaluable at times like this. Flushing the wound carefully can be a very important step. Do not use high pressure or you could drive debris into the wound. Ideal wound flushing solutions are isotonic (balanced for tissues) such as normal saline solution or Lactated Ringers. In a pinch, use water. Adding a small amount of chlorhexidine or povidone-iodine can help with bacterial contamination. Be sure to get some solution from your veterinarian which is properly diluted. Hydrogen peroxide is currently out of favor as a wound wash as it is felt that delicate tissues can be damaged by this. Once the wound is cleaned you need to decide if it needs a bandage or not. If your canine is a nonstop licker, a bandage will be important to give the tissues a chance to heal. Large wounds need a cover to prevent drying and speed healing. If you are cleaning a wound, then planning on heading to your veterinary clinic, a wet dressing is probably the best bet. You can use gauze soaked with saline or special wet dressings. 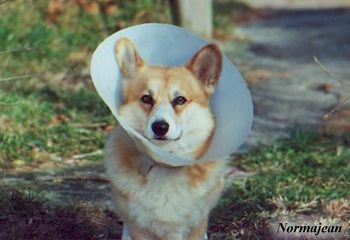 When Fido has any wound, it is always a good idea to at least check in with your veterinarian. She may guide you through wound care at home and depending on the type of wound and the cause (animal bite, scrape on fence, whatever) will decide if antibiotics are necessary and whether systemic (pills or injections) should be the choice or will simple antibiotic ointments suffice. For large wounds ? and that could be large in area such as a degloving injury to a leg or a single, but deep wound ? it is important to get Spot to the veterinary hospital. There your veterinarian may need to sedate or anesthetise Spot to thoroughly clean and debride (remove dead or badly injured tissues) the wound. Sutures may be necessary to close over a large wound area and drains may have to be placed. Some wounds simply need frequent bandage changes. Your veterinarian may be able to teach you to do these at home if your dog is not too painful and is cooperative. Many wounds are quite painful and your veterinarian will work with you to find appropriate pain medications for your pet. Once the basic wound care is done, it is important to help Fido heal in every way you can. Arnica can be very helpful in wound healing and good nutrition is essential to provide the building blocks needed to repair tissues. Keep your canine companion quiet and calm to aid in healing. Leash walks may be required and your dog has to leave the bandages alone. If you can?t be there to supervise a dog who is determined to remove bandages you may need to borrow an Elizabethan collar or discuss mild sedation with your veterinarian. Hopefully any wounds you encounter will be mild ones, but always be prepared to help with proper wound care and cleaning.